It's a holiday weekend, folks. I have three whole days off, well, almost, and my mind is awhirl with the possibilities of things I can get done around the house. The other day I looked at my get-done-before-Sirens-starts list which I haven't done in a while and hmph, I just don't know. A walk in the p a r k with my cool woodworking friend Scott is on the possibility list, a long overdue catch up, be a little sad, try to be a little joyous in memories, old friends walk. Yes, I still spell it out p a r k as I know Hailey's listening somewhere. Jeez, what I wouldn't do to be able to say "park!" and take her for a walk. Man. Ugh. Ikea Family sent an email with a coupon for a free photo book, so I need to do that before it expires. That will be a teary, happy/sad, hole in my soul adventure as it will be a photo book of Hailey's life. Some things on the list aren't realistic, like paint the kitchen cabinets. Or organize and paint and such in the basement. At least I'm having the wherewithal to comprehend that. Finish painting the front door? Maybe. Depends on the weather which isn't looking too stellar for the weekend. 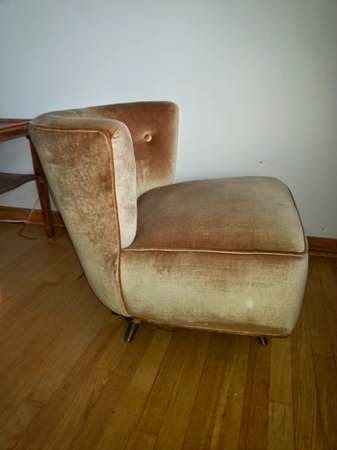 I did find a cool chair for the library on Craigslist yesterday but as per usual with Craigslist here in Chicago, the guy is flaking on me and not responding. It's too bad 'cuz it's very well priced and it has a great form. Chair from CL guy, his photo. Work on the basement bathroom? Ehhhhh....sounds really unappealing. I'm thinking about working on our bedroom as all I've done in there is paint the walls and hang my most favorite possession up. Mike and I agreed on a cool headboard idea which is pinned here, though ours will be much smaller. That would mean buying myself a nice big present: compound miter saw. Wait, bills, bills.....Ok, we'll see. I also had a curtain idea that would be cool but the big ginormous fabric store I'd go to is closed on Saturdays. That master bedroom is really calling my name though. Let's see, big master list.....Office shelves? Maybe. Paint the main stair? That requires a ladder, likely a paint sprayer. And for me to finally pick a color which I can't seem to do. Fix the screen in the back security door? Easy, and a possibility. Dimmer switch for the library light? Easy too, and a maybe. 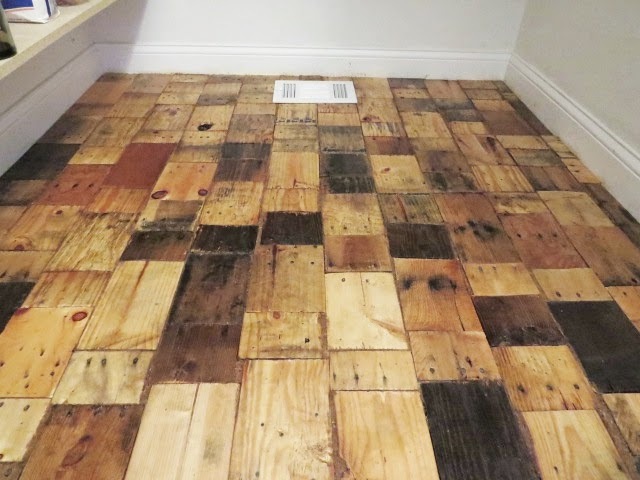 A library rug DIY?? Gosh. I really don't know! I suppose I could just rest and relax. Heh. Right. Likely I'll keep flipping through my list, wander around the house, see what I can get done. I will most certainly keep you posted! In the mean time, must make dinner. Hope you all have a great weekend! Well. Then I see this article from the SFGate about the 12 Things Successful People Do Over 3-Day Weekends while couch-surfing and relaxing this evening and now I feel wholly unsuccessful and belittled. Wow. Yeah, I have to disagree with their definition of "successful people" if a three day weekend is as regimented and work-like as work. Heh, I have to say, I'm a little put off. Ah well. To each their own, right? Rugs. Thinkin' about a DIY Library Rug. Yeah so, yeah. Thinking about making a rug for The Library. Look, I'm getting all fancy schmancy pants by using capitalization now. Because me, I will literally search through thousands and thousands and thousands and thousands of rugs online in one sitting. Often in more than one sitting honestly, searching for that right one. And because me too, I have top ten in the world champagne taste on a bottom of the barrel crap beer budget, so if I do find that rare winner, it's usually more than what's in my bank account. Ah well. On the bright side, I can make a rug, right? Sure. 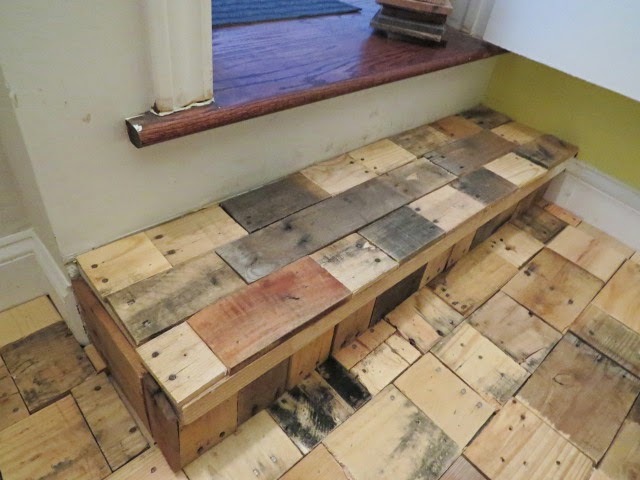 Sounds crazy, but what budget DIY'er is in their right mind anyway? Well, heh, I probably shouldn't generalize like that. Likely just me, not in my right mind. Eh, no wisecracks, folks. Because everything in the room is so linear, and rectilinear, some soft curves are in order to break things up and create some visual interest. Curves will also help lead the eye around the room. But because me, just a circular rug in there won't be enough now. I need more than one curve; I need several shapes and turns. Plus some floofy soft texture is needed too to even out those strict straight lines. I have yet to locate a chair. 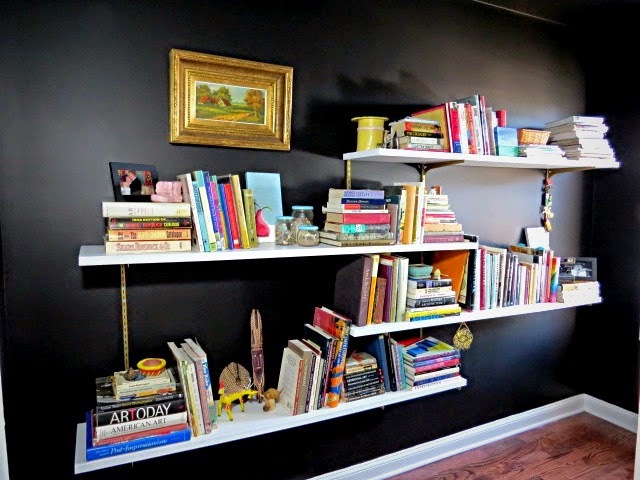 I know, it probably seems all kittywampus convoluted, like I'm doing this way out of order by painting the walls first, then making the pallet wood blinds, then adding the shelves and books, then putting up a light fixture, then thinking about a rug, a chair, etc. But, this is how I work sometimes. I have it all visualized in my head, and have had the whole room generally visualized in my head in its entirety from the beginning of the library process; I just need to find the correct pieces and parts to match. Everybody works and designs differently. Such a rule breaker I am, but then again, I don't think anyone should follow any decorating "rules." Do what you love, who cares what other people think. Please. Oh! My mom had a fantastic suggestion -- move my grandparents' table into the library. I'm going to try it, see how it fits. I have always loved this little Jetsons-esque table and it brings back fun memories. 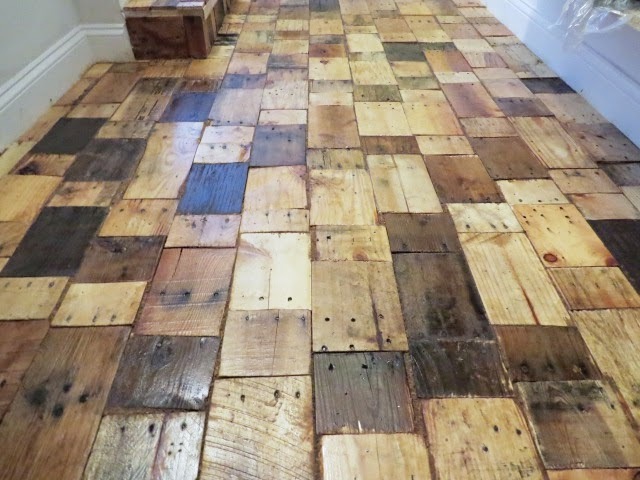 So I was on Pinterest yesterday, searching DIY rugs and folks had some interesting projects on there. Lots and lots of projects. I've been attention/focus incapacitated for the last month (gosh it's so hard to re-read old posts, jeez) so I only cruised over a few hundred or so. But I liked this idea, and I'm liking the pom pom rug approach too despite the onslaught of pom pom hate out there on some sites. I thought I could combine the two ideas somehow by getting an underlay such as Ikea has (I know Menards has it too but it's not on their website that I could find easily) and maybe make less full, floppier large pom poms. Or! Make less full super jumbo extra large size pom poms. Huh. Interesting. *chin rub* I do have several things of yarn that my sister in law Yan sent to me that I could use, plus a thingie of yellow that I bought a few months ago because I wanted to make some of these that I didn't get around to. So it's a thought anyway. I'll keep thinking as I have this strange feeling that Mike is crinkling up his nose at the idea as he reads this. He's never in that room, so, heh, it may just happen as an experiment anyway, we'll see. 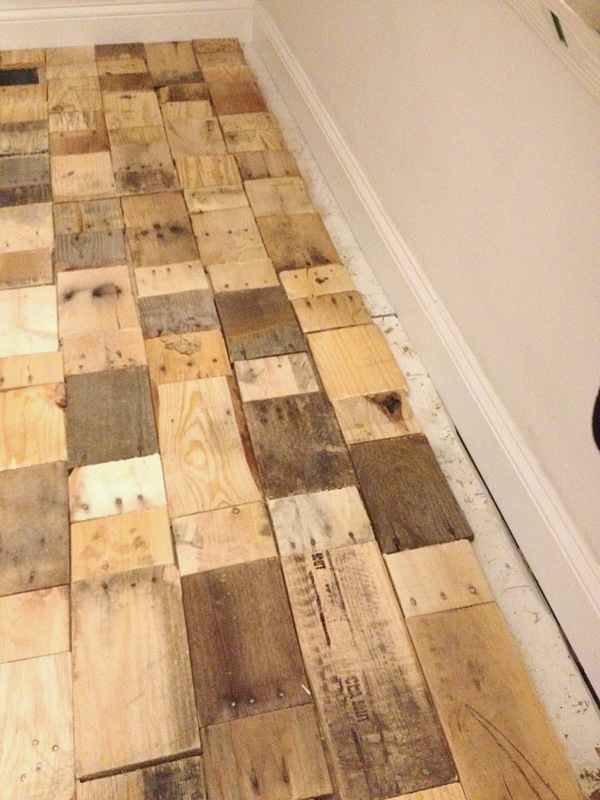 What would you guys do if you were going to make a DIY rug? Just buy one at the store instead, heh? What would be your ideal rug for that one little spot you know needs one? Library light fixture. Finally, right? Yep, bought some jewelry for the house. Treated myself, Mike and I, the house to a little gift. I mentioned a couple of times the light fixture I had chosen for the library. It was one of those moments when you see the perfect thing and suddenly there's a glorious glow about the world, you hear angels sing, the clouds part and sunshine reigns upon you. Ok ok, it wasn't that extreme but it was pretty darn close. Since Menards was having their 11% merchandise credit rebate on everything in the store thing going on again, I figured this past Saturday was as good a time as any to get the fixture. Especially since I had woken up earlier than I had intended and was well on my way to completing the five thousand loads of laundry that needed doing plus the other reduced-to-Saturday-only tasks at hand. 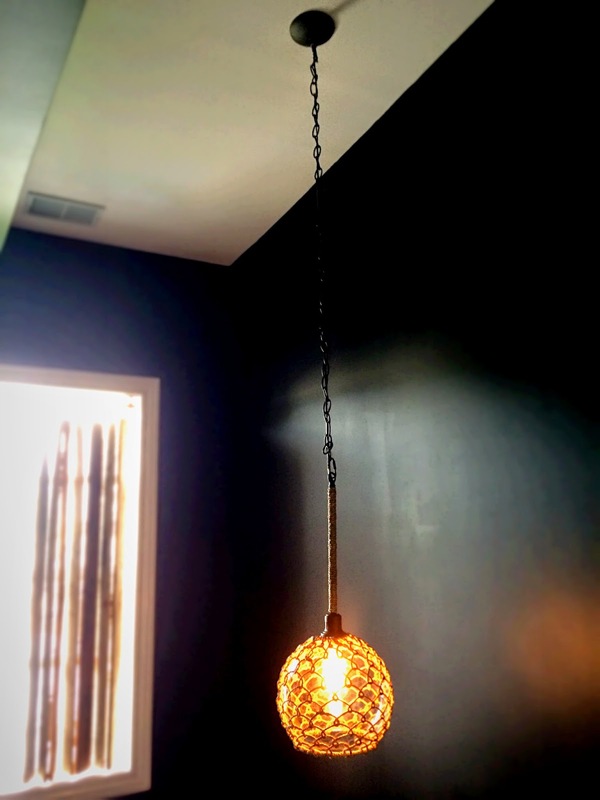 By the time I finally decided to go get the darn fixture, I had just enough time to get it wired and hung before heading out to meet Mike for a night out of town, away from home, out of the house. I have to admit, my friends, I totally fell for the display the store set up too. Usually I'm good at resisting such temptations, not wow'ed or lulled by store staging. But. This time they got me. They put one of those old time-y vintage-esque filament bulbs in the display fixture. Normally I'm not much for those bulbs as they're so overused lately, everywhere, and stuck incongruously into any whatever fixture. (Yes, I am a trend-avoider, for a lot of reasons. Mainly, trends: they come, they go.) What's an extra $8, I thought, for a fixture we won't turn on all that often? I'll even get eighty eight cents in store credit! Heh. My brain, right?! So there it is. 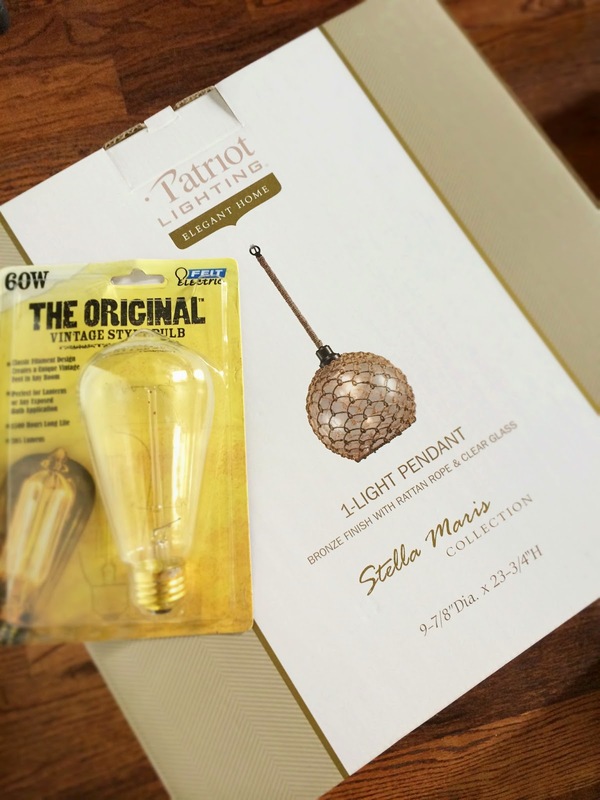 The Stella Maris light fixture and the retro bulb. Or lamp, sorry theater friends. Oh crap, the bulb (lamp) is on sale now. Grrrr! You bet I'm buying another one and returning it with the first receipt! Yes, I do that. $2 outweighs eighty eight cents. 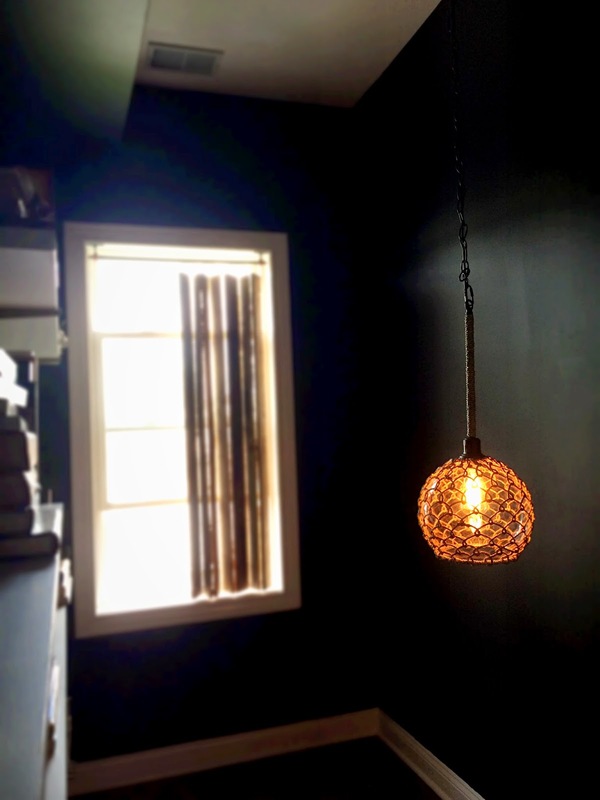 Previously, I wrote about changing out two light fixtures around the house. 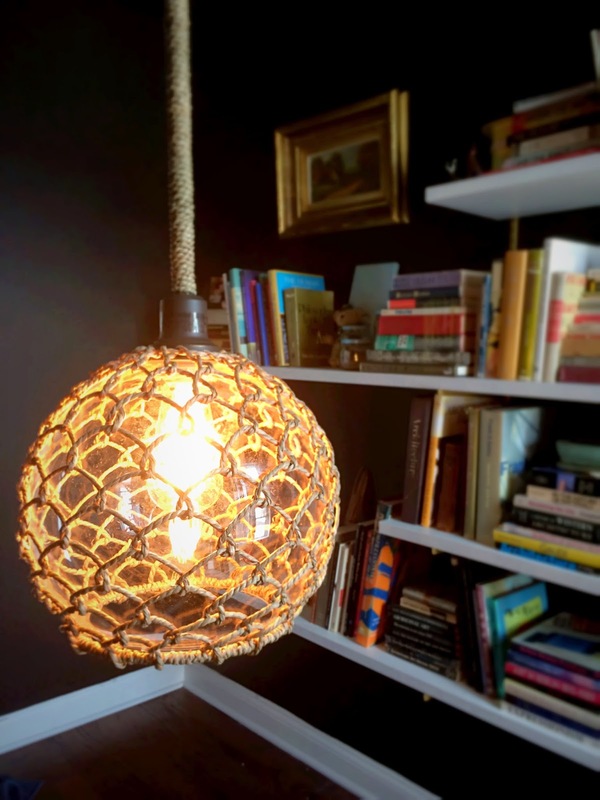 Oh, and the dining room fixture earlier this year. Basic wiring is a good skill to have in the ol' back pocket, and there are videos, tutorials, etc. galore smattered all over the interwebs. Start small though. Electricity is dangerous. Better to hire an electrician and be safe than sorry, ok? I'm even copying and posting my previous disclaimer to the bottom. Getting the old fixture down was cake. I didn't take a picture of it. It was ugly and sad and cheap. Nothing you want to see. No matter how old or how new a house might be, old or new the wiring is, it's always a surprise when you get the old fixture off, see what's inside the junction box. Or at least that's what I've found to be true, even in this house as every junction box is different. Though please, this house?, not much surprises me anymore. This time it was surprisingly tidy: only one white wire and one yellow. I've never put up a fixture on a chain before, so I was constantly battling with it slumping down. Plus, even though there's all that spiffy insulation in our ceiling now, it was still warm up there as of course, ya know, heat rises, making me sweaty and irritable. So, it took a little longer than I anticipated but it's up, it's in, it works and it's cool. I'll need to play with/adjust the length I'm sure. Or, who knows, maybe once I get a chair in there with a small rug, maybe a side table, art or mirrors on the wall adjacent to the light or maybe nothing at all, it might be interesting to leave the fixture hanging completely down like this. Super low, huh? We'll see. But now I am thinking dimmer switch. I should research and make sure this bulb is dimmable first though. Texture. Shine. Pattern. Nature type stuff. 70's vibe. 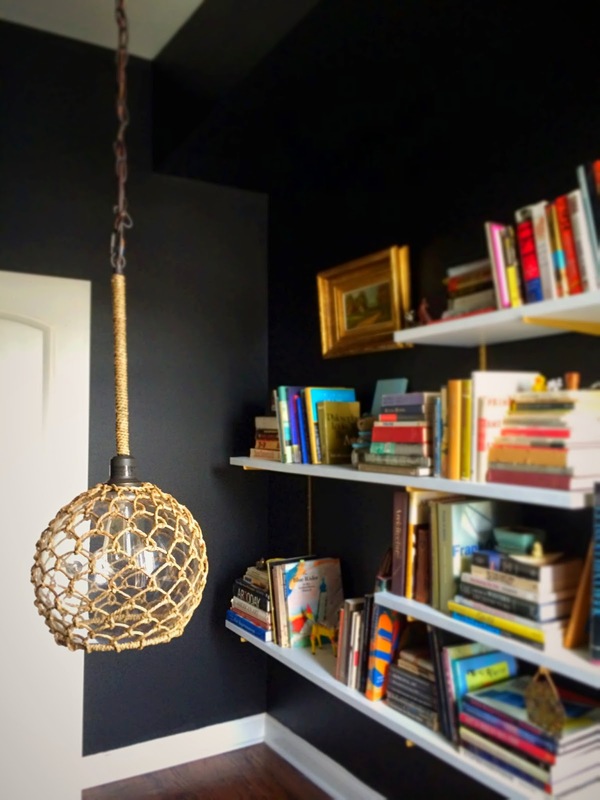 Goes great with the black paint, the pallet wood vertical blinds, the books, the gold shelf tracks. 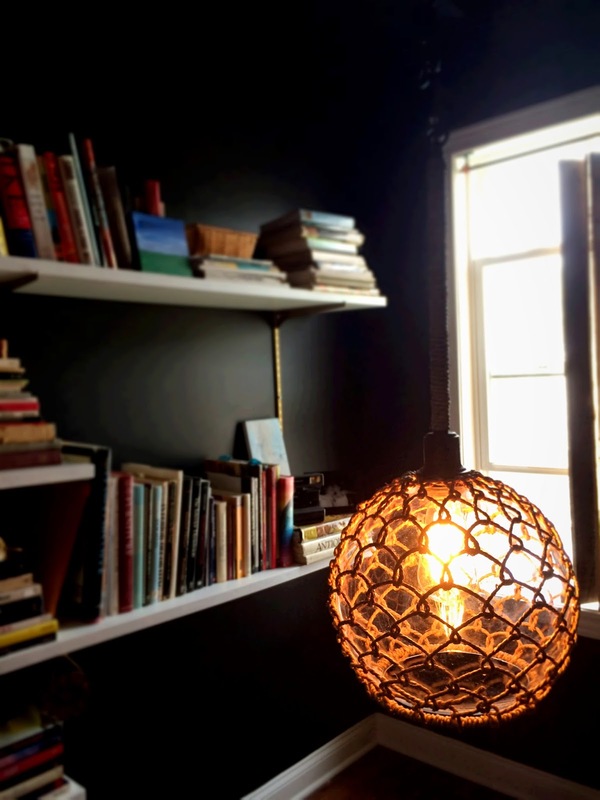 The perfect little light for our fancy schmancy library. And I love it. I will say though, we're having a tough time being at home, the one place we always always wanted to be all the time, the place I'm trying to fix up and make so nice. Today marks two days shy of a month since we lost our sweet pea Hailey so suddenly. I cry every day. Every day. I'm milliseconds away from tears at every given point, every minute of the day. Each day is a struggle for both of us. The routines, the patterns, turning around and being reminded by every single little thing, seeing pictures, not being able to look at pictures....It's been the longest, toughest, worst month of my not-all-that-short life as reality is burrowing its cold, evil clawed grip in. Thankfully Mike and I have each other and stores continue to stock tissues. So um, yeah. We were recently talking about going solar as apparently there's this convergence of programs going on here in Chicago, but credits are not turning out to be tangible rebates nor guaranteed, so we may take a pass. It would be fantastic, but we won't be staying long enough to balance out. Well, I dunno. We haven't completely decided yet nor talked about it recently. It's a hefty monetary outlay that's not accounted for, especially if things aren't true rebates. That's problematic; numbers aren't explained until you push them to give bottom dollar info, the total cost to finance keeps rising, and we feel a tad misled. Which is too bad because going green is good. So I've mentioned we bought from one of those flippers, right? Yeah, the gifts keep on giving. I thought he was bad; I'm rethinking now -- he's the worst. After we had Dr. Energy Saver out to take a look, and he used his spiffy thermal imaging camera gizmo, it was quite clear that we had no insulation, zero, none, zilch in our second floor ceiling. Who does that, not bother to put at least something up there? Sheesh. What an a**hole, am I right? We had this dilemma before when we lived in Logan Square. 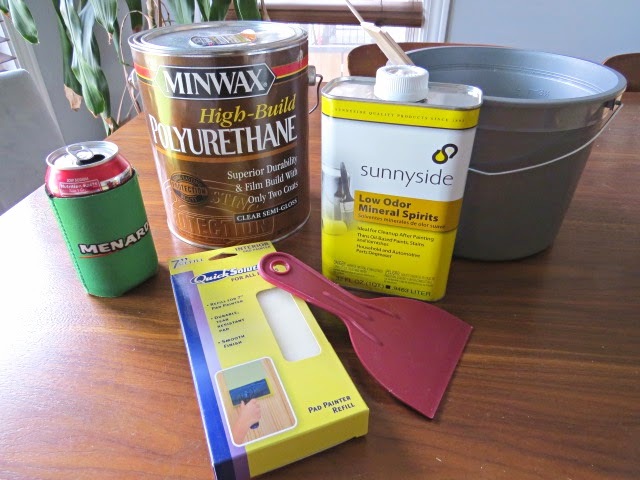 But that time, we opted to go the DIY route. Our friend Jason even volunteered to come help us as he had done it before he said. What could be so hard, we thought. Ok, it's not hard really. A confluence of this, that, the other thing made it a huge marital strain day and I've probably blocked half of it out my memory. We had never been as upset with each other before that day, nor since. It...it was bad. We rented the blower machine from Menards. All fine and good except when it got dropped off, it wasn't working. Mike called them and they didn't want to bring another, but after um, I'm not quite sure what he said, they came back and switched them out. The thing was monstrous and monstrously heavy; we needed it up on our second floor back deck so Mike made the Menards guys hoist it up there. Yikes. So yeah, at this point, Mike was in a grumpy mood, shall we say. Then we each had our own ideas on how to accomplish the task at hand. That didn't help matters. At all. Frustration ensued. Everyone was angry with everyone else. I was outside filling the hopper, Mike and Jason inside filling walls and ceiling. But the hopper level wasn't going down much so I kept popping in and they were just kinda sorta ya know, not much on the effort there, so I got really upset. In the end, we got some stuff in but nowhere near what needed to be done in the ceiling. If I had pushed for that, we might have all killed each other. Needless to say I suppose, we packed it in for the day. And needless to say too, when the idea of blow-in insulation was discussed for this new place, you better believe the DIY option was not on the table. We went with Illinois Insulators and wow, are we glad we did. Their quote was in line with area pricing, I liked the sales guy and it's a rare thing for me to like a sales person, everything he said made it clear to me that they knew how to handle our quirky multi-level ceiling situation, everything was all very professional, and the deal-sealer: they patch the hole they make. Be sure to ask -- not everyone does which I thought was incredibly weird. I wasn't in attendance on insulation day as I'm hard at work on Sirens season two, but Mike was and I made him take photos and notes for me. Two guys arrived right on time and got to work. They cut a two foot-ish square-ish hole in the ceiling in the hallway. Considering every room is a different ceiling height on the second floor, I'm pretty amazed and thoroughly impressed that they didn't have to cut more. I have trained Mike well, I must say. And he knows me very well. He popped up that ladder and took some photos inside, bless his sweet heart. He knows I would have gotten up there and done that. What he saw....well, let's just say the problem with not getting any heat or a/c on the second floor has been figured out. Um....w...t....f....is going on here? Why is it...? Huh? Who does this?!?! 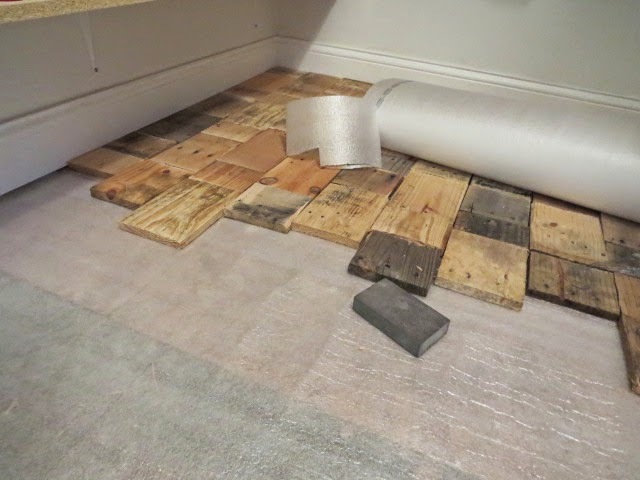 This is my favorite photo, with the flexible duct snaking all over god's green earth and smushed in the joists. Um.....My brain about exploded when I saw this picture. Mike said the situation is mighty bad up there, worse in person. Yeah. Comforting, right? Honestly, between you, me, and the walls, I sense an email going out to a lawyer sometime soon. Construction defect, I'm going to hang my hat on. Mike said too it looks like the framers did their thing and then suddenly everyone was like, oh, crap, wait, we have to put some duct work up there. What confuses me further, aside from the shoddiest work I may have ever seen in my entire life, is that somehow this all passed the city building department HVAC inspection. It says so right on the city's website. Uh huh. A-yup. How.....?? I'm not even sure if flexible duct like this is up to Chicago code either. Oy me. Hoping that's Mike's flash and not a ginormous hole in something, shedding light from outside in. Just some extra photos for you so you can see what's going on in our second floor ceiling from that one open spot. Lovely. What wonders to behold in other areas? I'm terrified. Dr. Energy Saver quoted using some fancy Aeroseal stuff but now, yeah, clearly that's not going to help at all in any way possible whatsoever on any planet. The guys kindly put a big tarp down to protect our super crappy carpet. After two hours, the job was complete. Two hours? I was blown away. Ah ha, a pun, blown away....Right, ok. That is some super speedy insulation blowing though. And to continue the pun, I was blown away that they were able to get the cellulose into each room's ceiling solely going through that one single hole. Seems impossible to me, but those guys are the professionals. In the end, they patched up the hole. Albeit, not the best patching job in the world but hey, considering I wouldn't have been able to get to patching it myself for months, I truly appreciate it. At least now all I have to do is fix it and paint. And also in the end, the final bill was to the exact penny of the quote. Nice. A+ there, Illinois Insulators! My favorite-ist favorite part though? I came home from work that day and there was a marked difference in temperature upstairs from before -- it was moderate and in line with the first floor. Brilliant. Oh I was so thrilled. Even today, a warmer day than Thursday, it's not hot up there as it might normally have been. I did remember today to look into rebates from our utility companies for this work and as it turns out, we would have had to have used one of their participating companies. If a rebate is important to you, do your research ahead of time. I thought I had, but clearly, I did not. I asked Illinois Insulators and our sales guy said in order to participate in the program, for them and the customer, the costs are much higher; they prefer to not participate and pass along the savings by offering a lower price. Anyway, we're still thrilled with how the temperature is steady and moderate upstairs now and very very very very glad we did this work. Ah fantastic! 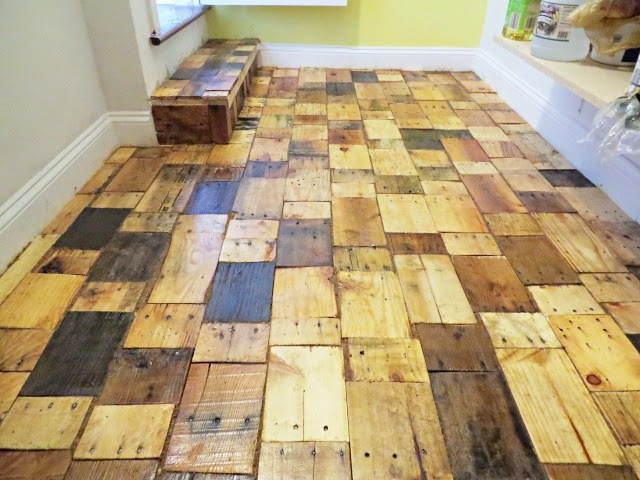 I finally got the pantry floor finished and wow, yay! 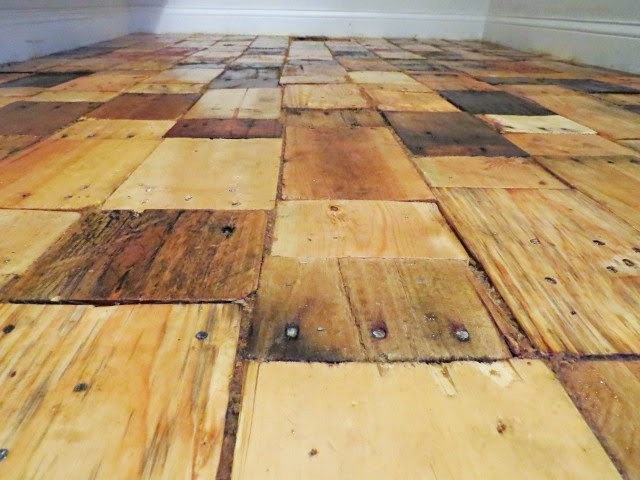 I'm excited to have completed that floor at last, and I must say, I am proud of it. And myself. It was quite an undertaking indeed but I think all the hard work and effort paid off. I have yet to check it off my list but I'm looking forward to putting that pen to paper! 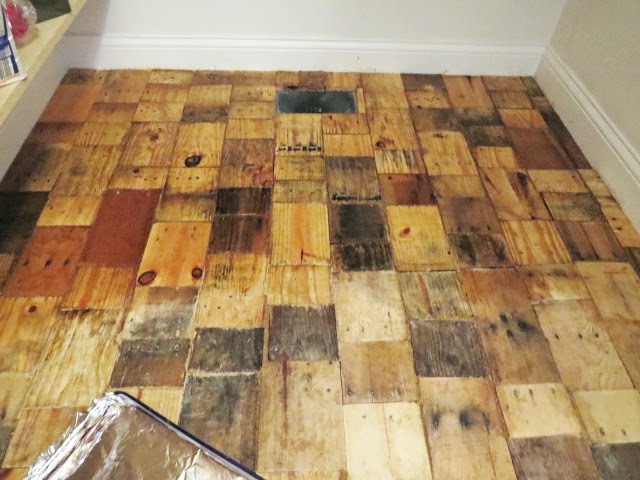 Mike loves the floor, whew; he said, "it's your greatest triumph in the house to date." Nice compliment, huh? He's the coolest. It's one of a kind, it's unique, and it came out better than I envisioned. 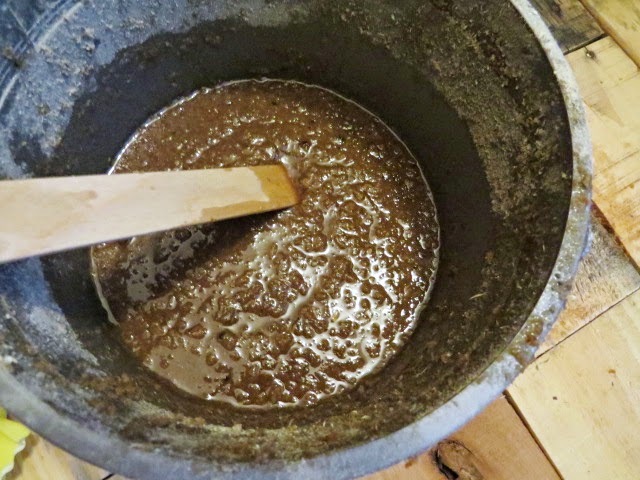 I'll pepper in links to previous posts about the whole big long process which in some cases elaborates further on the steps. 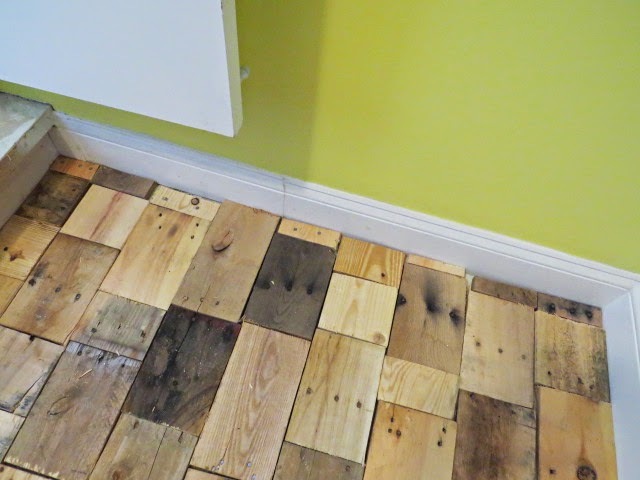 In searching for older pantry floor posts, the list is lengthy and I see my first inklings began in early April. I will admit, it's very painful rereading some of those older posts. It's kind of funny to type the materials list -- it's way shorter than it feels like, heh. Probably because it took what feels like forever to collect the wood. I began by collecting the individual cut pieces from Twitchy. Each time I collected a batch, I would arrange them on the floor which also allowed me to track my progress on how many more pieces I needed. Shortly after the wood collection began, I painted one of the walls in that happy happy Lemon Curd color, my now favorite yellow. 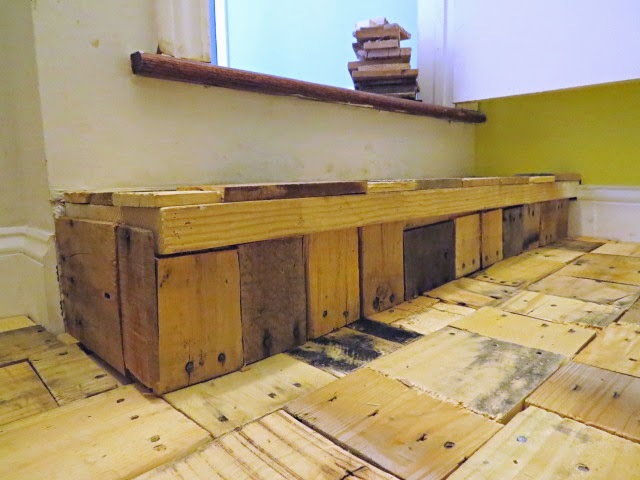 Once the wood pieces were all completely laid out, the opposite end required some trimmed pieces as well as along the wall opposite the main shelves. There's that Lemon Curd. Pretty, isn't it? After getting all the bitty bits and pieces in, I turned to the small step. I had also been collecting thinner more slat-like pieces of wood and arranged them on the face and step. Still some tidbits need attending to here, but close to done is good. Next up, time for floor underlayment. 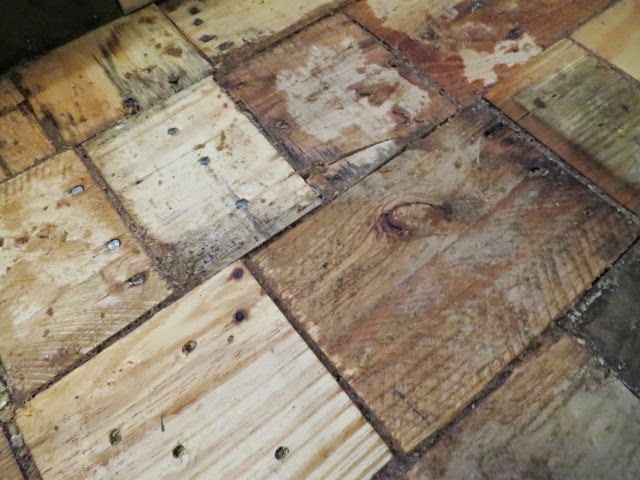 The original floor under the cheap ratty un-vacuum-able carpet was a mix of OSB and old old floor boards that appeared as though they were part of a porch of some sort. And with this flipper, who knows what the deal was. 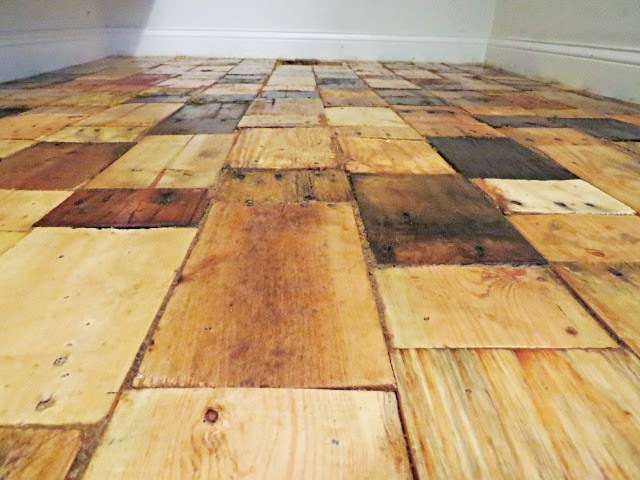 But because the floor would vary in temperature more than one would anticipate throughout the seasons, mainly because there's a ginormous gaping vacuous area open below the floor, a layer of insulation was the right thing to do. I measured out a piece, trimmed it easily with scissors, then stacked a portion of the wood pieces in reverse order in small piles. 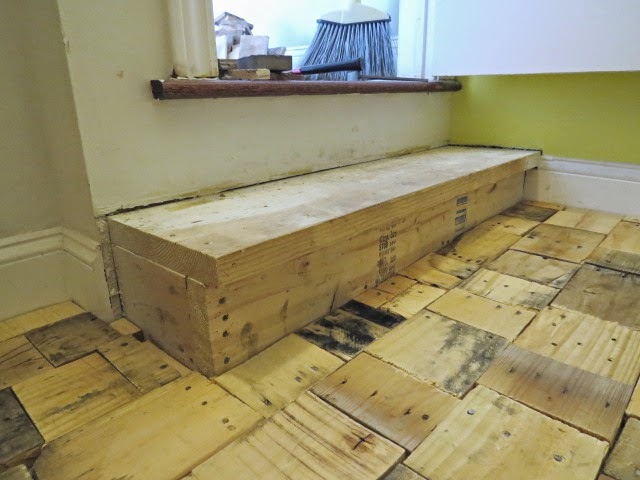 Stuck that underlayment down, re-lay out the wood and it was onto the next section. Once everything was good to go, it was nail time! I tacked it all down with a nail gun, courtesy of my excellent woodworking friend Scott. Thanks to my fine woodworking friend Scott too, I had a nice pile of very fine sawdust. I had also gotten some planer "dust" but it really was a bad bad choice, so avoid chunkier shavings-like stuff. 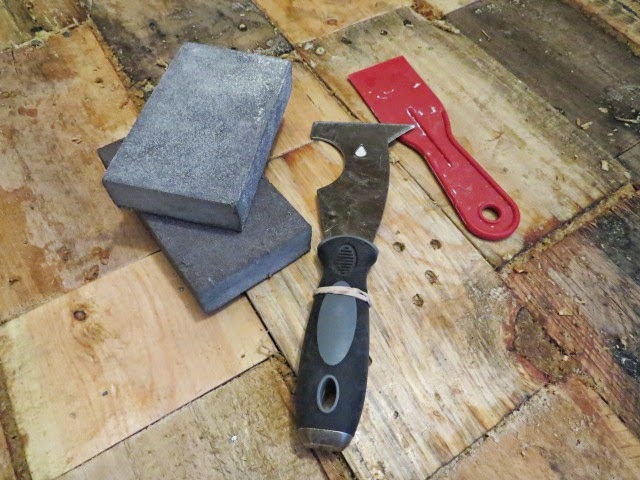 Mixed with mineral spirits as a thinner and the polyurethane, I had my "grout." It was a complicated and messy venture, certainly slow going. Not hard to do, mind you, just interminable if you're a perfectionist like me. It required patience and perseverance, mainly I think because the spacings varied wildly and the wood pieces are not of equal thickness. Eventually (5+ hours later eventually), it was filled in and dried overnight. The next day was ugly. I thought I had been tidy but clearly, ugh, I had not been. Sigh. 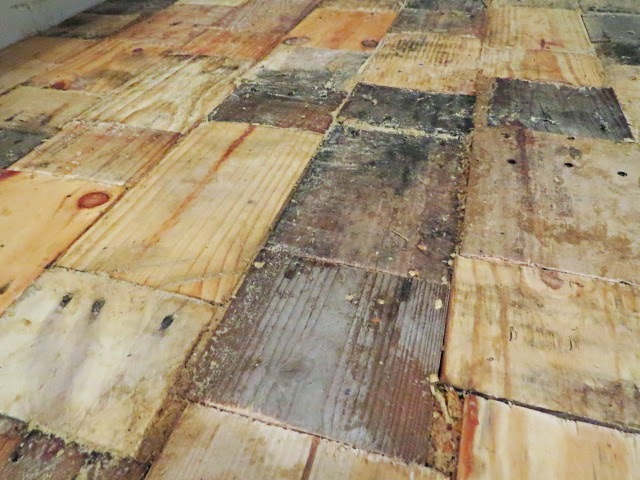 There were dried crunchy chunky messy bunches stuck all over the wood. Aw man, I was disappointed. And panicked. After scraping and scraping and scraping which could have gone on forever, I had to just stop and seal the floor with the poly. I was nervous. Whooie, way nervous. What if the poly didn't hide the scrapey mess?! 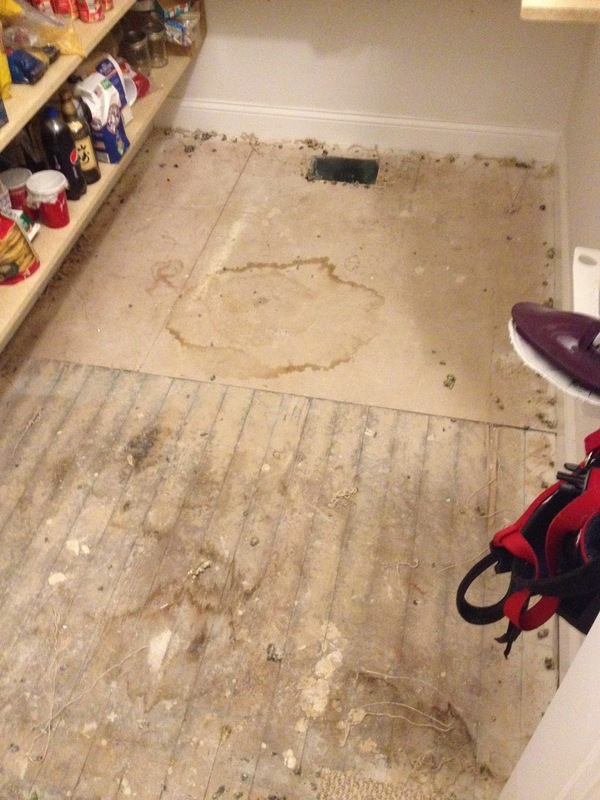 What if all my hard work was for naught, ruined in one fell swoop of sawdust grout mess?!?! Using a paint pad, I applied the poly by hand so I could flood smaller gaps, minimize bubbles, and closely control the poly. I closed my eyes, ran the first swipe and whewwwwww, the mess was erased. Yesss. What a relief!! Two coats was all I had time for before my Sirens back to work deadline. Hopefully two coats will tide us for a bit until I can get another coat or two on there after this season's work has wrapped. Pretty pleased with the way it came out, I must say. A little pat on the back for myself. Yay, right? But yeah, it's back at work time for me which means I won't be able to work on the house much, if at all. Sad face! We are having blow-in cellulose insulation done this week in our second floor ceiling (!!) and I've asked Mike to be my eyes and documentarian so I can share with you. So what does this mean for my blog? I'm not sure yet what direction this will go for the next four-ish months, so I hope you'll continue to hang with me until December here and there until I'm fully back at my list, refreshed bank account and raring to go. Thanks very much for everything, everybody and hopefully I'll be seeing you back here right soon! Happy birthday to my dad today. And today would also have been Hailey's 12th birthday. She is so missed. 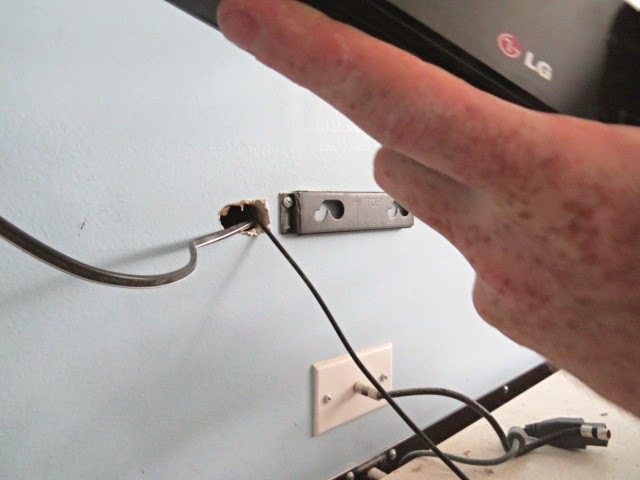 All right, so as I've mentioned a couple of times, my cool friend Janette contacted me in regards to messy, flailing in the wind television and cable wires, if I had that common, unfortunate problem. I don't know how she knew that I did, that getting those cleaned up and hidden were on my countdown-to-Sirens-back-to-work to-do list. 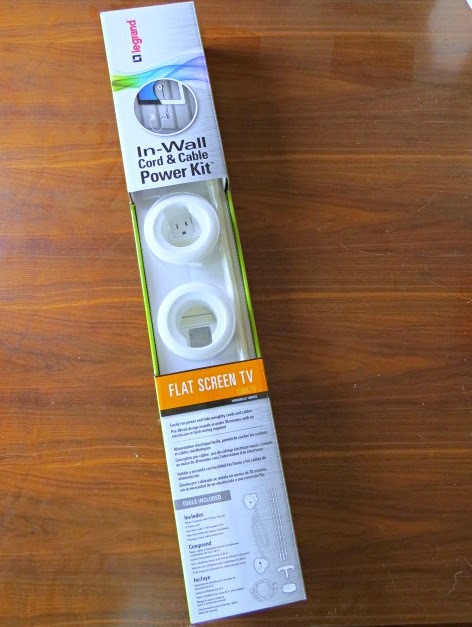 She's been reading along here and when the PR team at Wiremold by Legrand asked if she knew anybody who could test out and review their In-Wall Cord & Cable Power Kit, she asked me. Holy thrilled was I! A chance to do something for Janette and as a bonus, that ugly zoo of cables on our wall was going to disappear? Nice. I am unquestionably anti-visual clutter so this was perfect. The idea behind this kit, she said, is that it is meant to make the process of hiding the cables easy, that anyone can do it regardless of skill level especially because the kit contains all the tools, pieces, and parts you'll need. Further, there's a spiffy, brief, clear as day video online that shows the process for those who dislike written instructions. Don't mind my dusty dining table. Sheesh. Shortly after our email exchange, a box arrived with the kit and like a giddy school-kid, I was super excited to get going. Then life stepped in and this got postponed, then postponed again. But finally Mike and I made plans to get this done today. And we did. After watching the video together, we unpacked the box. So few ingredients I thought, and it doesn't attach to the wall studs, huh? But, hm. Ok, let's go. I should have checked the city code beforehand but didn't. You should though, as recommended. The kit we received is intended for a simpler arrangement of television, tabletop boxes, and outlet. No worries, it just took us a bit more brain crunching, configuring, finagling, and one extra hole. 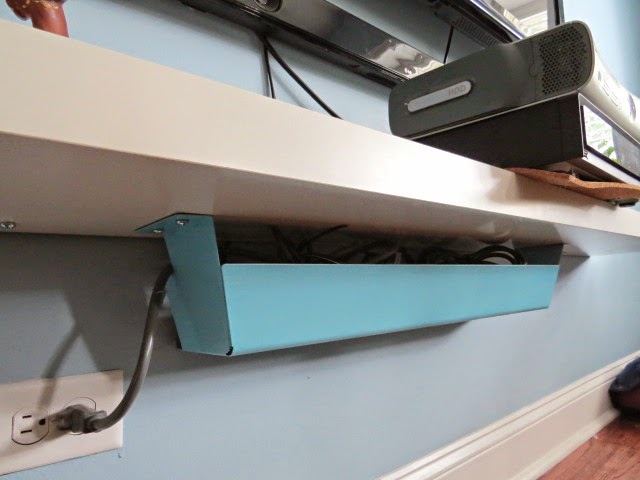 As you can see, I attached an Ikea cable management doohickey to the underside of the Ikea Lack shelf for a power strip, the game console plugin thingie and extra lengths of cables. It's unattractive still despite my spray painting it an unmatching blue and my attempts to minimize the mess, but it does its intended job I guess. 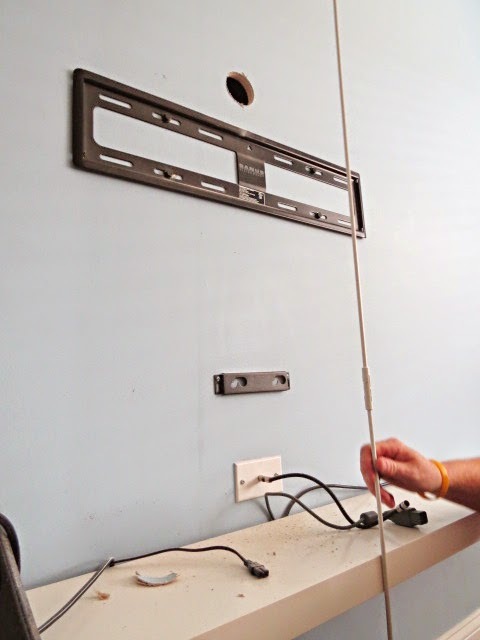 Ok, so we started by assembling the included hole saw and while the guy in the video makes it look easy peasy to turn it by hand on his built stage set, we had to dig out the corded drill. 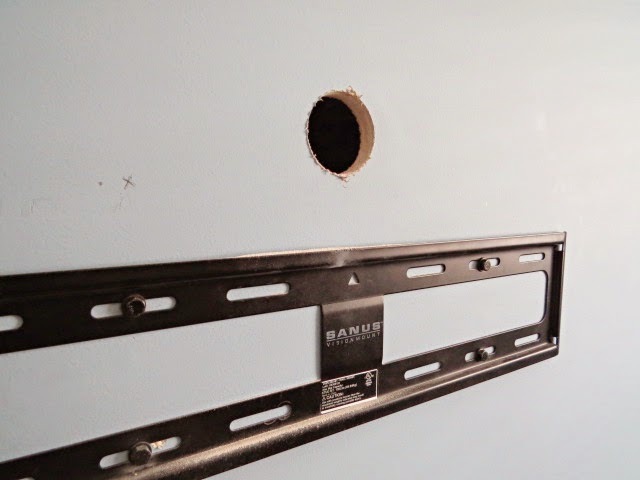 * No problem though - the hole saw made quick and handy work of the two required holes in the wall. After all the holes in the basement bathroom though, I still struggle to make holes anywhere, heh. 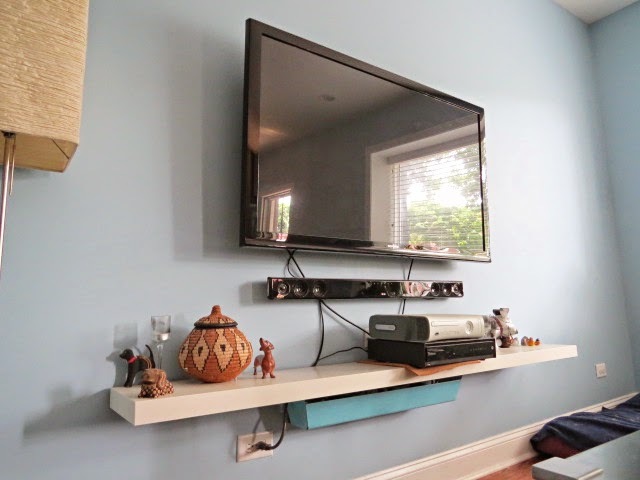 We already knew where the wall studs were from hanging the television initially. We didn't measure for the kit part holes as advised in the directions, rather just eyeballed it, but measuring is good if you're feeling unsure. Next up was fishing the cables and such and the top kit part with the plug into the wall. Here's where our brains hurt thanks to the soundbar and the back of the tv inputs being spread all across instead of logically in one spot. Mike didn't care if the soundbar cables were seen, but since we were going to this effort, I wanted all the cables hidden. What baby wants, baby gets. I love each and every one of those Mike freckles. Inside the top hole. See the window with no glass? See any insulation? Neat! Of course our digital optical cable for the sound bar wasn't long enough, right, so we had to dash out and pick up a longer (so overpriced) one. The only issue we had with the kit was the plastic fish line. Right off the bat the hook snapped off without much effort as Mike was attempting to snare the plug on it. Then we had a spot of trouble with it not being a bit more flexible. And then the two pieces disconnected while inside the wall. Nothing duct tape couldn't fix though. Mike felt the pieces should screw together and I thought the pieces could be shorter to save on packaging though that might inhibit bend-ability. Mike said too it was hard to keep the fish line tight to the back side of the drywall, again due to inflexibility-ish-ness, and we realized if someone has insulation in their wall, it might prove tricky to squish things through. But, all in all, we got it to work. The hook piece for the fish line, broken off, sad. Once we had the longer optical cable, the rest of the process was super speedy. 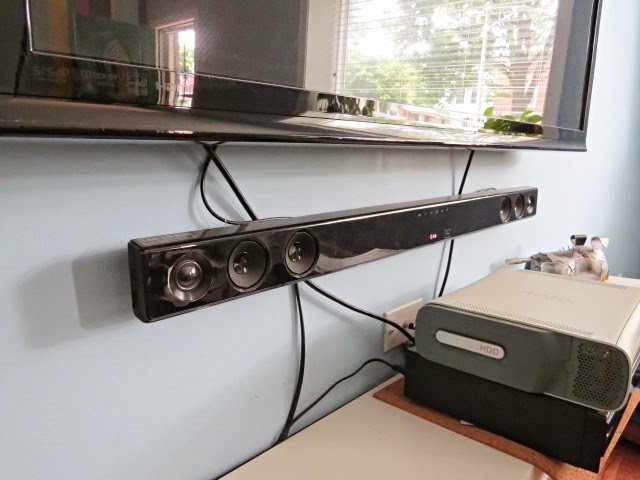 Fish the soundbar cables through, insert the top kit part in the wall, tighten screws to attach, then snap on the faceplate. A very clever design on the back keeps it tight to the wall - when you tighten the screws, little flaps pivot to work as wall anchors. After that, attach the plug end to the back of the lower kit part, squish through any other cables you need, place the part in the hole, tighten the screws, and snap on the faceplate. 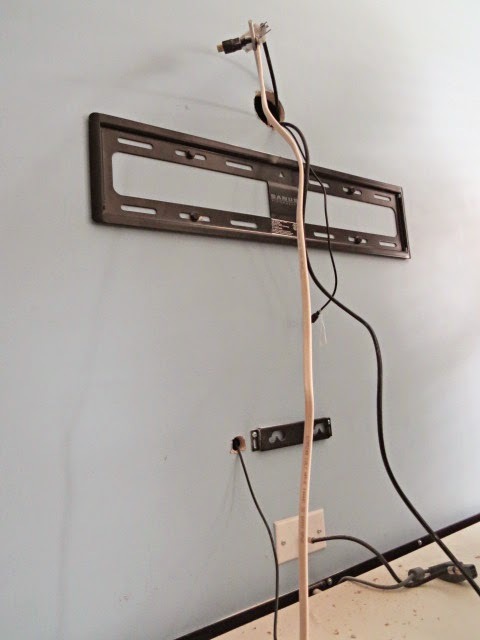 Plug in the provided power cord, connect and re-place all your components, then kick back on the couch with a cold drink and enjoy your cable-free wall. Sweet, right? Beautiful!!! Love it. Love love love it. Someone really thought through the engineering of the pieces, every step of the process, and how to smartly streamline both the parts and the process. And I was quite impressed. I truly think this is a mighty clever assemblage of a DIY kit, appropriate for anyone to use, and it does the job perfectly. I mean look, no more unsightly cables! None! No cables!! I am thrilled. Truly thrilled. It's easy to use, intelligent, and fast. Thumbs up from us for sure. While we didn't get it done in the under thirty minutes they claim, it was surprisingly quick. If our set up was simpler, under thirty would have been nearly attainable. It seems the pricing on the kit varies but regardless of cost, despite my excessively thrifty blood, I would wholeheartedly recommend this kit without hesitation every day of the week. 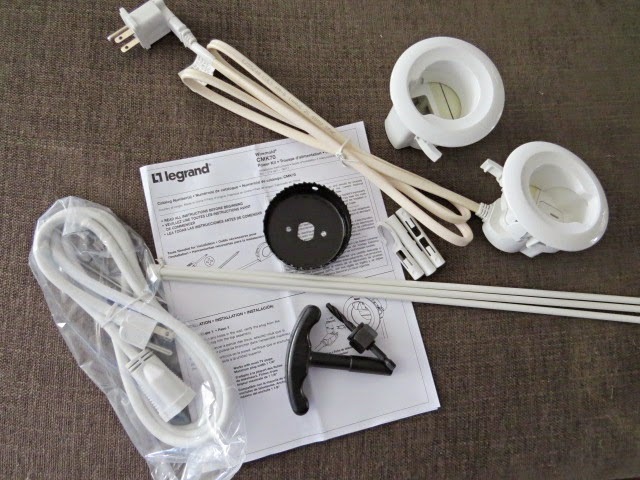 So thanks Janette and Wiremold by Legrand. You're both awesome! Update: Several hours later I hear from the other end of the couch, "ya know, it really is nice not to see all those cables." Win! Disclaimer: While I was not compensated in any way at any point, I did receive the product for no charge. I was thoroughly encouraged to be upfront and honest about the product and our experience. The opinions here are completely my own. And Mike's too. Pinky swear. And while I was not compensated, here is an affiliate link through Amazon (one of many places that carry it) to purchase the kit. Thanks! 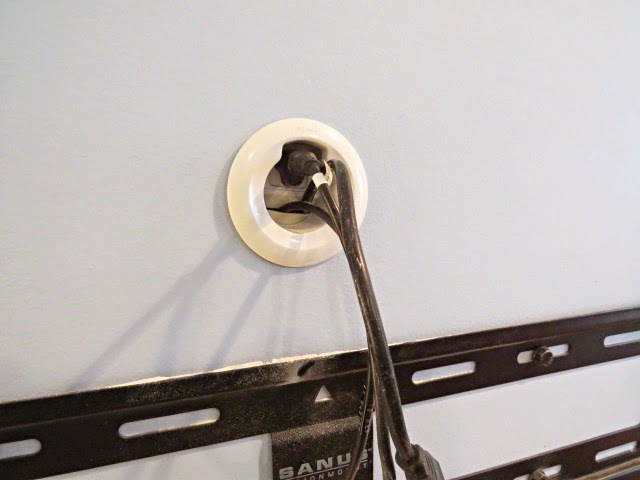 Too, if you can't go into your wall, here's another affiliate link (see the "boring stuff" tab for an explanation on affiliate links) for other types of cable management thingies. To see the updated, vastly improved television console, click here! 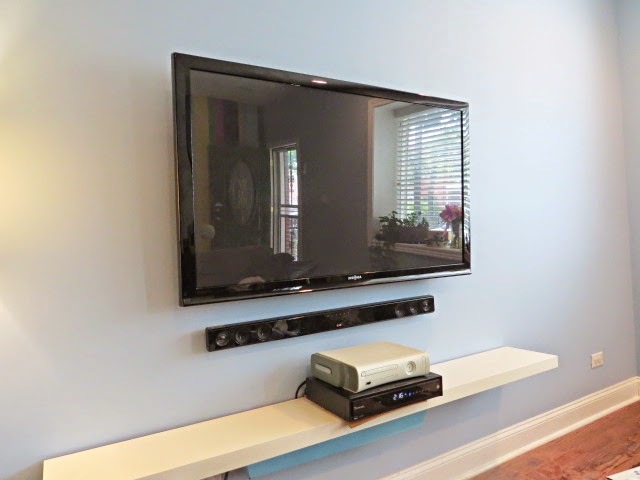 *The new television and sound bar kit is an eBay affiliate link. Use eBates (that's a referral link -- we each get a cash bonus if you sign up and use it) and get cash back on your purchase! 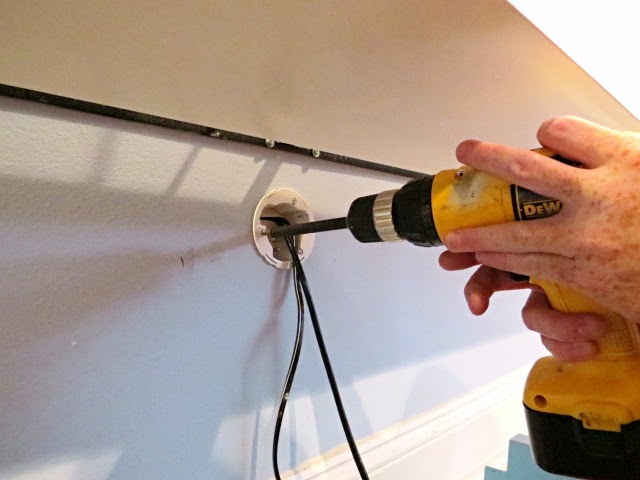 The corded drill is an Amazon affiliate link. Mwah, thanks! Please see the "boring stuff" tab for more info.